I was able to squeeze in a store visit before my dentist appointment this morning and got to try on a few of the new items. This didn't show up on the website yet but it's a Karmacollected Jacket in Heathered Rich Earth. I haven't loved this in the photos too much thus far but I thought it was really cute on. (Thanks to Ms. S. for the last photo.) The weight and warmth felt very similar to a Scuba. I thought the fit was a snug TTS. I don't think the Cozy Car Coat has been uploaded yet and has only surfaced in a few photos. This jacket had an oversized fit. I liked the Karmacollected a lot better. New Power Y pattern. I think this is the Capilano Stripe pattern. 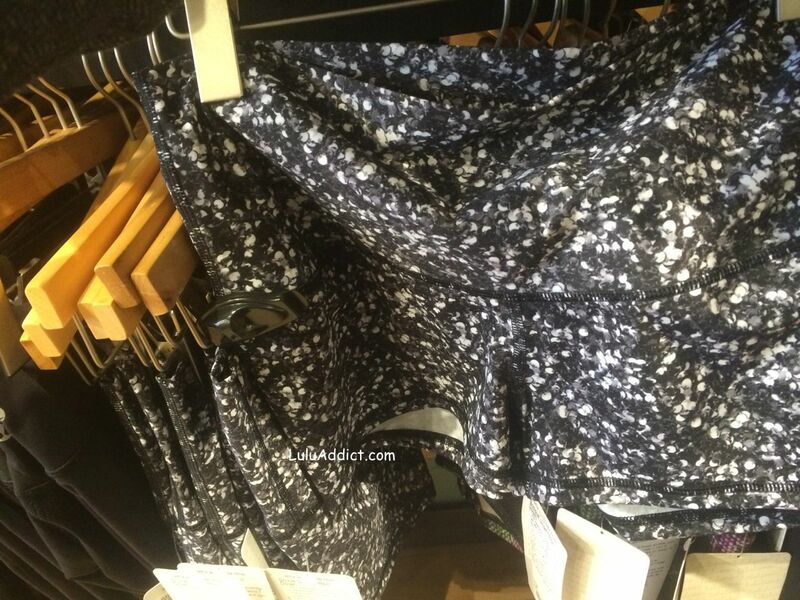 I thought these were Boogie shorts but now that I look at them again they are the Shine Short Roll Downs in the Garden Party and Shimmy Shimmer print. The waistband looks too big for Boogies. I got to try on the Flurry Fighter Pullover today. I really, really liked it. It was warm, soft, and nicely thick. I thought I would return one of the two I ordered but I'll probably keep both and sell my Base Runner hoodie to clear some room in my closet. The neck on the Base Runner always makes me feel like I am choking and I find the cuffs on the wrists very tight. I thought the fit on this was TTS. I also got to try on the Karmacollected Wrap and Pant. I really liked the pant and was sorely tempted to get them. They fit very wide through the thigh so if you have larger thighs these pants are good for you. They were thick and warm. If this pant had a straight leg to be more like cotton fleece yoga pants instead of sweat pants I would have bought them. I might still go back and get them. They were nicely cozy. I didn't care for the wrap that much. I felt like I was wearing a hooded bathrobe when I put it on. I tried on both the Giant Herringbone and the Nightfall Stained Glass Love Speed Tights, too. For all that I've been dying for my Stained Glass Love tights order to arrive I didn't love them on. I think the Ambient Arsenal and Snakeskin tights feel a bit stretchier. 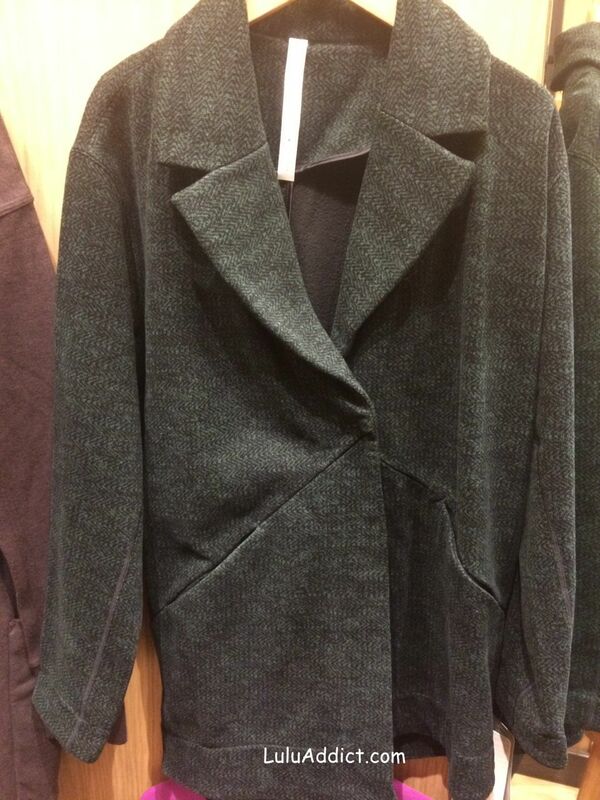 However, I did like the Giant Herringbone a lot. The material is not as soft feeling as the Giant Herringbone Skinny Will pants but I thought it was stretchier than the full on luxtreme that all the print Speed Tights are made of. I am a big sucker for herringbone, and these are an unusual look in a run bottom, so I bought these and intend on returning the Stained Glass Love tights I ordered last week. Whoops, I forgot to ask about the Karmacollected pant..was that TTS..Also, does the leg taper, it's hard to tell in the picture because the model has boots on...I usually wear a 10 in the studio pant..would I wear a 10 in the Karmacollected pant? 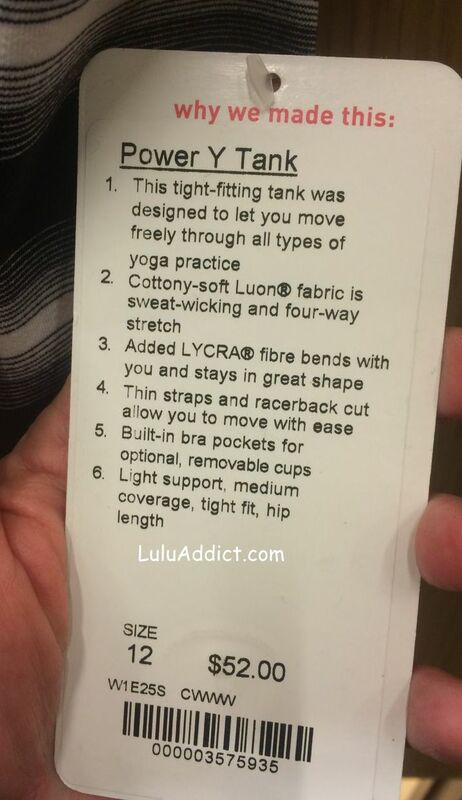 @lulu - the leg does taper down. 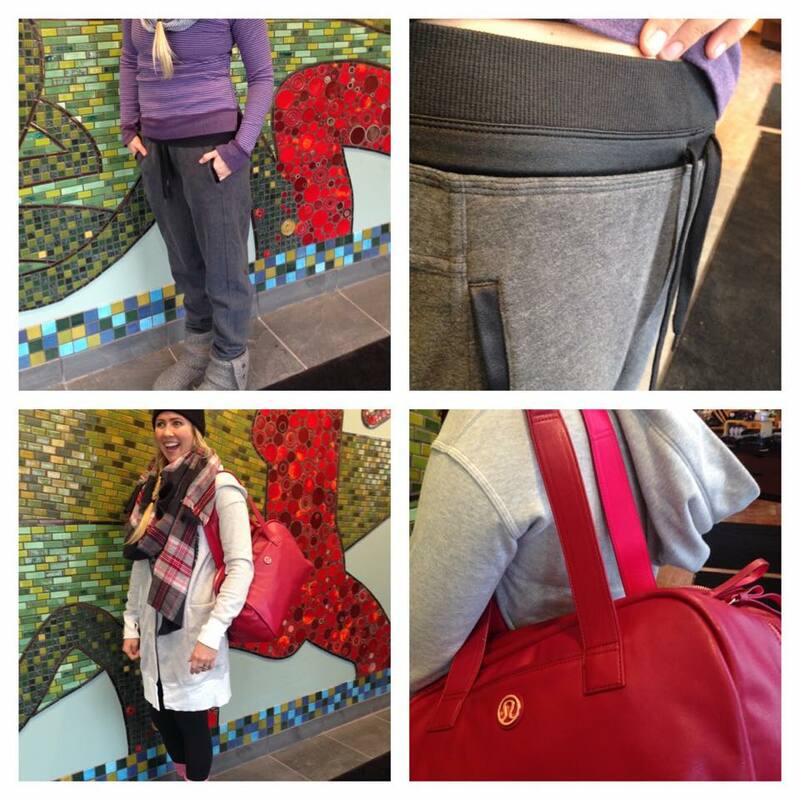 I wish it was straight to make them more like the Lulu Pant IIs. My store got the wrap in the Brown. I can't remember if there were other colors. 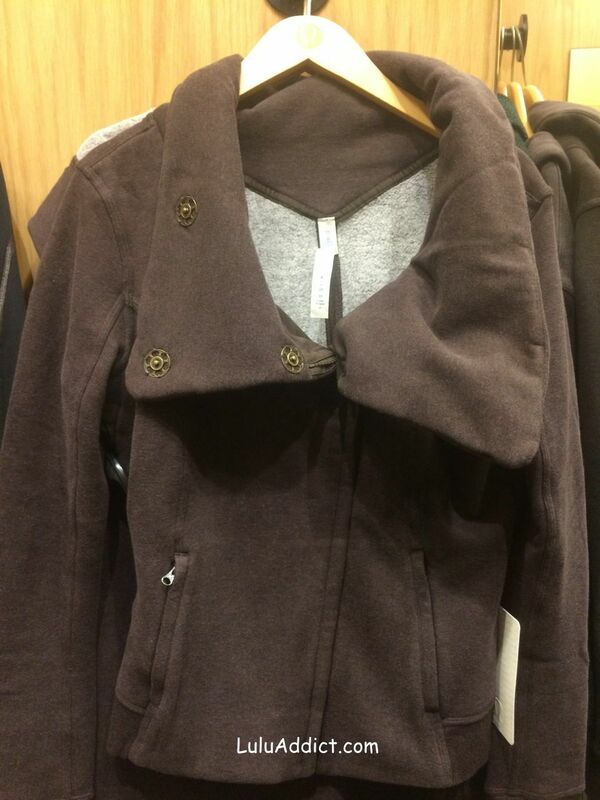 I only grabbed the brown to try on. I ordered the karma pants in the rich color and I'm tempted to get the gray before they're out in my size. I'm tall (5'10") so I'm afraid they're going to be too short for me... They're really cute with the boots so maybe that'll work! When is the next upload? Next Tuesday? exquisite pants: i really liked them, and leaned toward my smaller size 6 (too much fabric in the 8), but as a reviewer on the LLL website noted, they have this really tight elastic at the very top of the waistband. this means they won't fall down, i guess, but also means they are kind of constricting. the 8 was comfortable in the waist but still gave a bit of muffin top, but the 6 was definitely uncomfortable. i wanted the black grape and they didn't have it in store - not sure if i will end up ordering or not. tried the high times pant in 6 and 8. 6 fit but was a bit sheer; 8 was probably fine and didn't seem sheer. 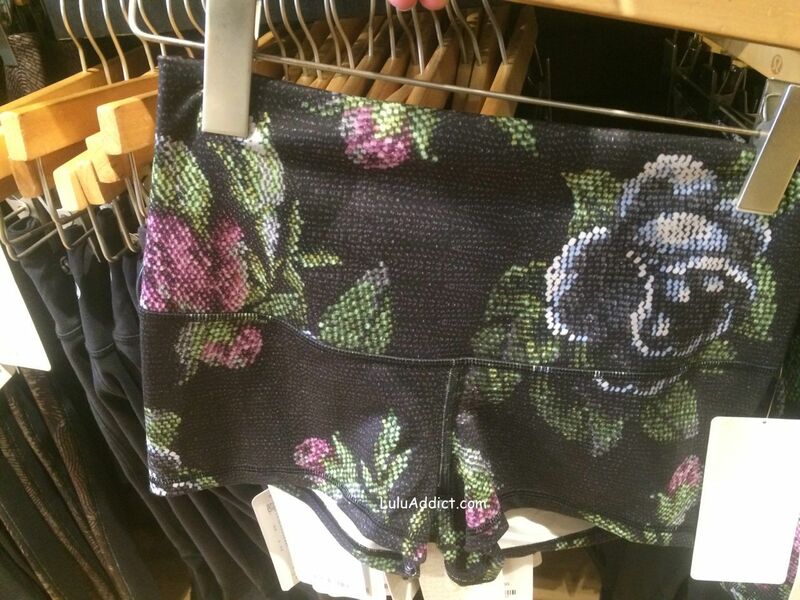 these were black, the only color they had. they were definitely shorter than WUP. i'd be interested in trying the coco pique. i finally tried on free to be wild bra, and surprisingly it fit me well! 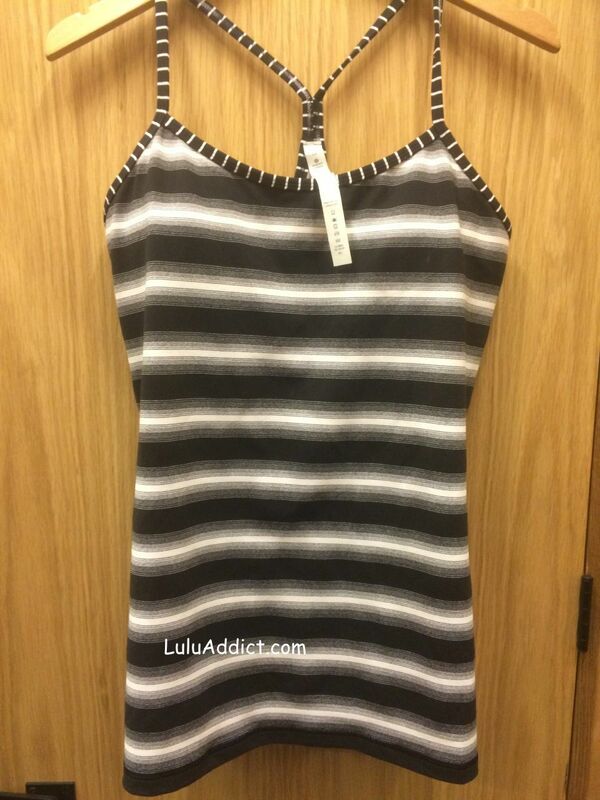 i ended up with 2 (violet and stripe) in size 8 - didn't even try size 6.
got a mind/body kit in the dream rose pattern, but the one i got has these big sort of beige dots over the black and white print - it doesn't look like the one on the website has that. not sure where it comes from but might order another on line to see if it's any different. also pattern placement could be better, but it was their last one. 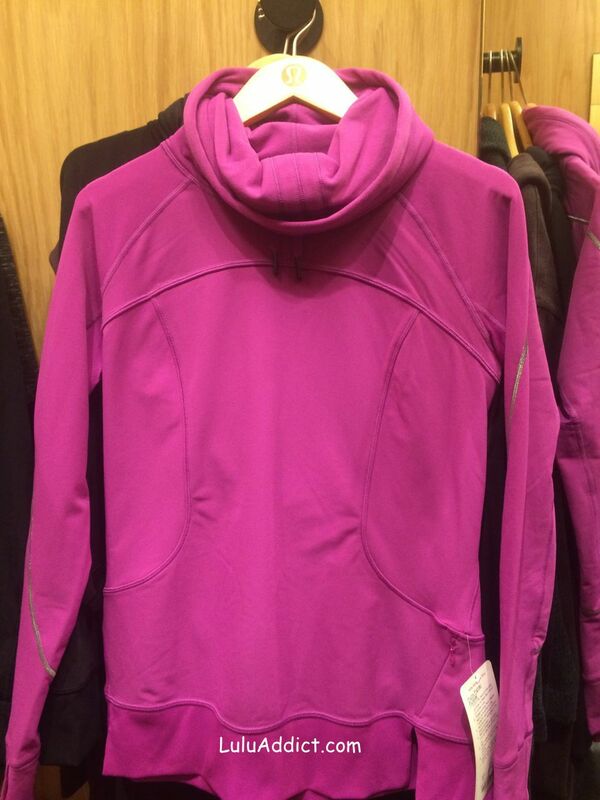 Thanks for the review of the Flurry Fighter pullover, especially regarding the quality of the rulu. I'm going to check it out in store. That is the first pic of that jacket that has made me want one--looks amazing on you. @ anon 6:23 pm - Lol, that isn't me but a friend of mine who let me use her pic. I think she is a size 6. @ anon 5:08 pm - They are not extra thick. They are slightly thicker than regular luxtreme and not as thick as fullux. What time is the upload? Is there an upload tonight? LLA what did you end up keeping in speed tights... was it Ambient Arsenal, Snakeskin and Giant Herringbone? 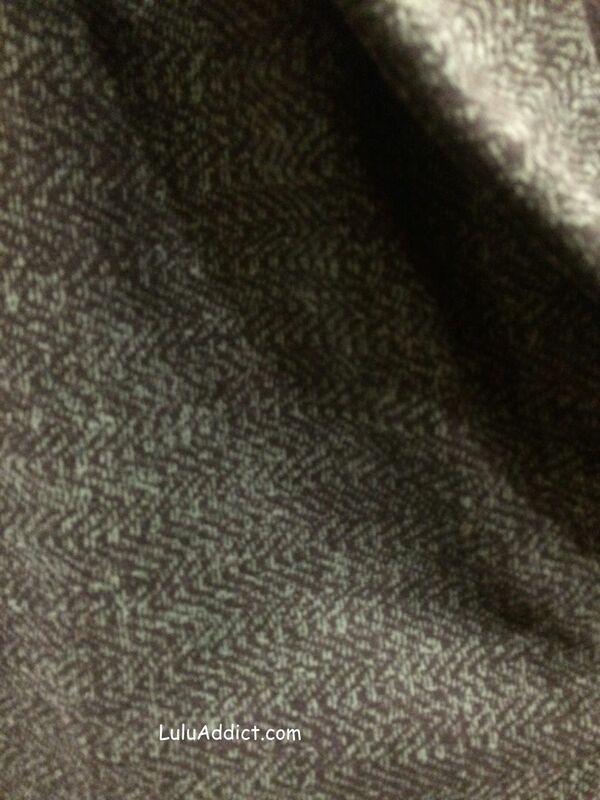 Is the ginat herring bone a print (solid on back side) or a yarn dye (same front & back)? what made you return the Stain Glass...just the material or the fit? asking b/c I like them all. would love to hear another perspective. 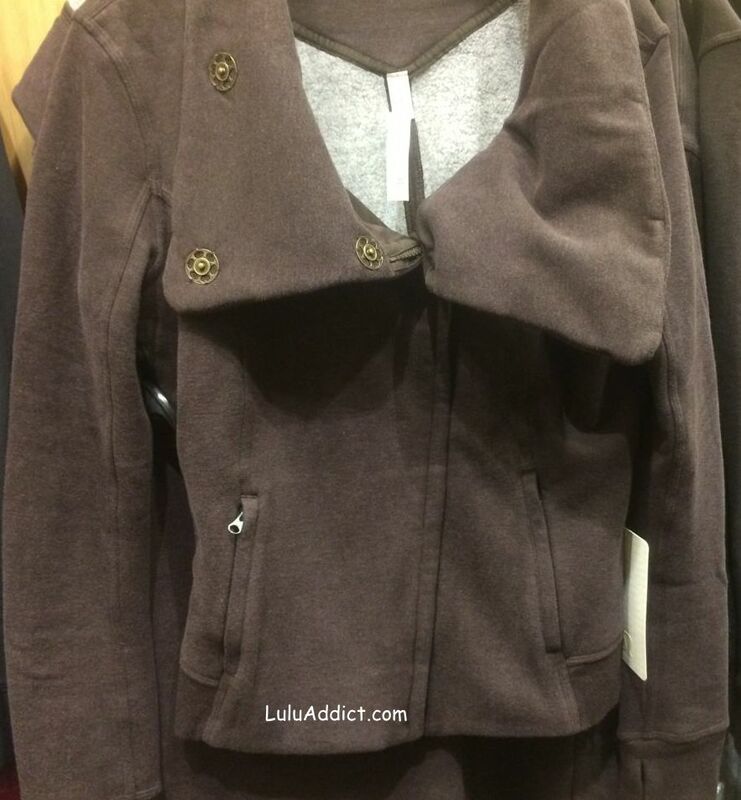 LLA - so does that mean that you don't find the neckline of the flurry fighter pullover to be restricting? I have the base runner po from last year, and that is the main reason I don't wear it very often, and I thought this po might have that same tight neckline. ... thanks! @ anon 7:51 pm - the neck is not at all restricting- it's more like the Don't Hurry Be Happy (DHBH). @ anon 7:43 pm - I kept the Sequin Serpent and the Giant Herringbone. I liked the Arsenal Ambeint Gray, too, but didn't get it. I am returning the Stained Glass more for the feel of the material - I preferred the stretchiness of the Herringbones. Also, I live in Southern California so don't really have need for a lot of Speed Tights. I can send EMT or paypal and shipping, pretty please!! !